For the classic cream cheese dough: Combine the butter and cream cheese in the bowl of a stand mixer fitted with a paddle attachment. Beat on medium speed until smooth and creamy. Switch to low speed and gradually add in the flour. Stop the mixer and scrape the bowl and beater to make sure it is well mixed. The dough will be sticky. Divide the dough into three portions, wrap each in plastic wrap and flatten to a disk. Refrigerate for a minimum of 2 hours or overnight. For the filling: Mix together the sugar and cinnamon in a bowl. Chop the almonds to small bits and toss with the raisins and sugar-cinnamon mixture. 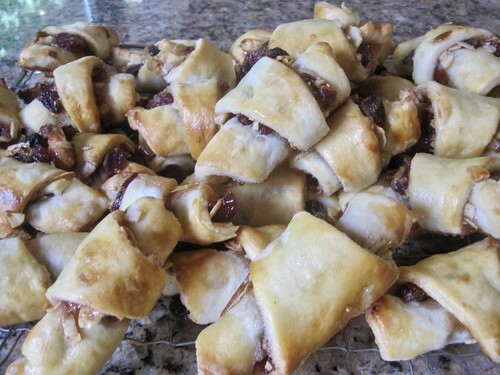 To assemble the rugelach: Dust the work surface with the flour and roll each dough portion to a 10-inch circle. Lightly brush each circle with the melted butter. Spread a third of the preserves or jam on each circle, leaving a clearance of 1/4-inch on the perimeter so the filling won’t ooze out while baking. Sprinkle a third of the almond-raisin-sugar mixture on top of the preserves and press in slightly to help adhere. Using a pizza wheel, divide each circle into four quarters. Divide each quarter into three thin triangles, for a total of 12 wedges. Roll each triangle from the curved side to the point and place on a parchment-lined or nonstick baking sheet. Refrigerate the sheets for 30 minutes while preheating the oven to 350 degrees F. Note: The rugelach can be frozen on the trays and then stored in a zip-top bag in the freezer for baking fresh later. Carefully brush each rugelach with the egg wash, trying to avoid drips. Bake for 15 to 20 minutes until deep golden. Cool on a rack and store in an airtight container for up to 3 days.